Bisphosphonates Pharmacology | All the Facts in One Place! Bisphosphonates are medicines used in the treatment of bone disorders. For example – they can be used to treat osteoporosis, Paget’s disease of bone and hypercalcemia caused by the presence or otherwise of malignancy. Bisphosphonates remain an important medicinal class; a drug class first developed, at least in their modern form, throughout the 1960s. Originally, bisphosphonates were developed for non-biological reasons – for example: to help soften water. Since then, bisphosphonates have become the mainstay of treatment for a wide variety of bone and calcium-based disorders. Osteoporosis – alendronic acid is first-line treatment in patient groups at risk of fracture formation, such as post-menopausal women. Hypercalcemia – which may manifest as a result (or not) of bone metastasis. Multiple myeloma – bisphosphonates are routinely prescribed to help prevent fractures. They are also used to prevent fracture formation in a variety of other cancers that frequently impact bone, such as breast cancer. Paget’s disease – also known as osteitis deformans, Paget’s disease is characterised by irregular bone remodelling. With these indications in mind, let’s take a few minutes to review bisphosphonates pharmacology; how the drugs work to exert their therapeutic effect. Put simply, bisphosphonates prevent the breakdown of bone. The less bone that’s broken down, or “remodelled”, the lower the risk of developing fractures and the lower the release of calcium ions into the bloodstream. These drugs also ensure that bone density remains high. Osteoclasts are responsible for bone remodelling; they break down bone. In contrast, osteoblasts are responsible for bone formation. Bisphosphonates work to inhibit the effects of osteoclasts, encouraging these cells to undergo apoptosis, or programmed cell death. More specifically, bisphosphonates are taken up by bone cells because they are structurally related to compounds like pyrophosphate. Enzymes that would otherwise use pyrophosphate are now inhibited from doing so. The bisphosphonates listed above are all examples of nitrogenous-containing bisphosphonates. Nitrogenous bisphosphonates act on the HMG-CoA reductase pathway, the same pathway that statins act on – however, statins act at a very different site to produce their anti-cholesterol producing effects. These two metabolites are responsible for connecting proteins in the cell membrane – causing a disruptive effect for osteoclasts and, by extension, bone resorption. Bisphosphonates are associated with their own range of potential side effects. Bisphosphonates are also linked to hypophosphatemia. Esophagitis is a common side effect, particularly through oral administration – an effect which may lead to many of the side effects listed above. Some bisphosphonates – such as zoledronic acid and pamidronate – can only be administered via the intravenous route. Additional side effects include high blood pressure, fever and joint pain. After their first infusion, they may cause flu-like symptoms. Renal impairment is a potential side effect. Patients must take adequate hydration before administration. A rare but serious effect, osteonecrosis of the jaw (ONJ) – a risk associated more with long-term intravenous therapy. That patients taking oral bisphosphonates – such as alendronic acid – should take the medicine 30 minutes before breakfast, on an empty stomach, with a full glass of water. Patients should remain upright for 30 minutes post-administration. This helps to reduce the risk of esophagitis. That bisphosphonate absorption is reduced if they are taken with calcium or iron products. Absorption is also reduced by antacids. That because bisphosphonates are renally excreted, they should be avoided in patients with significant renal impairment. That because bisphosphonates reduce calcium levels, they are contraindicated in patients with hypocalcemia. That the risk of osteonecrosis of the jaw (ONJ) increases in patients with significant dental disease or in patients who are smokers. That bisphosphonates, due to their irritant effect on the GI tract, should be avoided in patients with significant upper gastrointestinal disorders. Pamidronate and zoledronic acid are administered via intravenous infusion, most commonly used to treat hypercalcemia or bone metastasis. Oral alendronic acid is first-line treatment to reduce fracture risk. Zoledronic acid can also be administered once-yearly via IV infusion in patients – both men and women – at risk of developing fractures. Bisphosphonates continue to play an important role in the treatment of bone disorders, hypercalcemia and as part of a wider cancer treatment. Given their therapeutic effectiveness, limited drug interaction profile and ease of administration, their use is likely to continue unimpeded in the coming months and years. 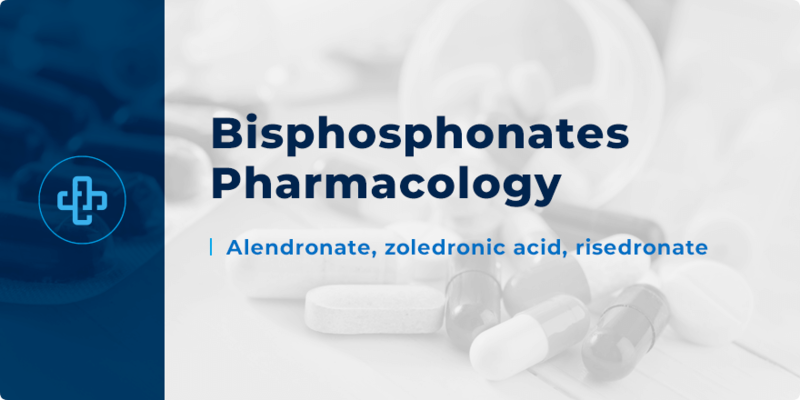 Want to learn more about bisphosphonates pharmacology? Register with PharmaFactz today to receive instant access to all the resources you need. In the meantime, take a few seconds to join our pharmacy blog newsletter (above) to receive all the latest facts direct to your email!